All color photos on this page courtesy of Tony Dellamano, Taken 6/2000. 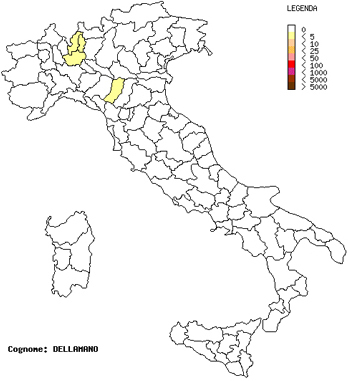 Francesco Dellamano, his wife Teresa Borlenghi, and all of their children were born in the Hamlet of Gisazio in the town of Perledo in the province of Lecco in the region of Lombardia in Italy. Perledo is located in northern Italy on Lake Como. 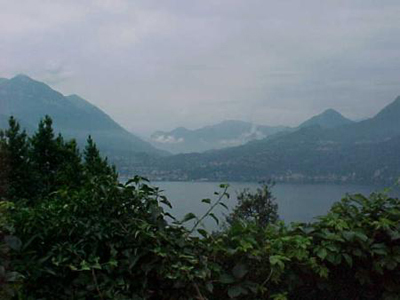 Tony Dellamano visited there and brought back this photo of the amazing view from Perledo of Lake Como and the Alps. 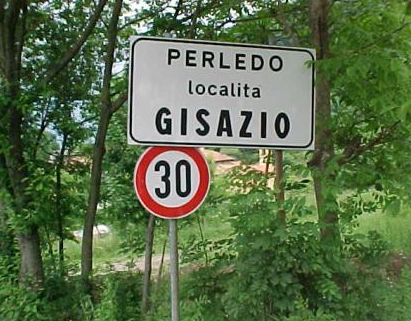 A sign indicating the village of Gisazio, within the area of Perledo, where Dellamanos have lived since at least the 1500s. 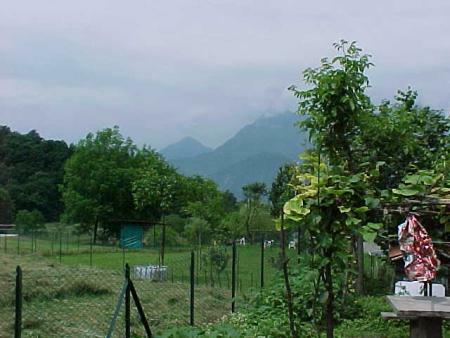 The view as you enter the front of Gisazio village. 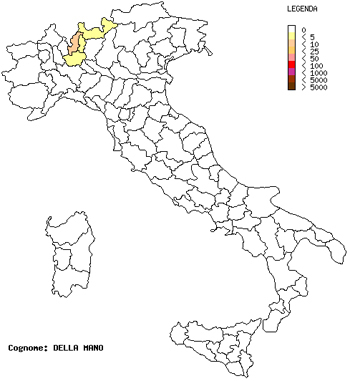 Gisazio is what the Italians call a "frazione", or "fraction" of the town of Perledo. It consists of maybe 30 houses. There are several frazioni in Perledo. Gisazio is one of the smaller ones. This was the home of Francesco and Theresa Dellamano and their family. 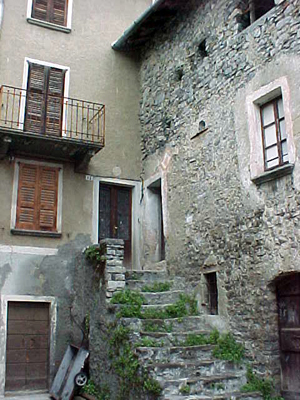 It is the house in Gisazio where Antonio and all of his siblings were born.It is no longer owned by a Dellamano. The next photo shows a crest that can still be seen on the side of the house to the right, dating from 1449! Giovanni De Fugamo of Gisazio. in the year of the Lord 1449., The Crest on the side of Francantonio and Paoloa Dellamano's house in Gisazio. According to Paola (and history), the family made cheese for the region. 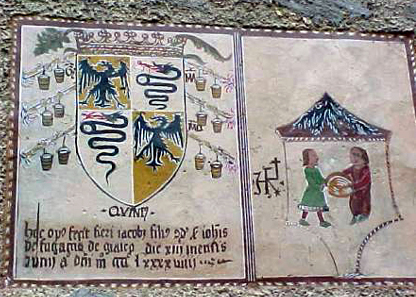 The pictures of buckets around the crest on the left indicate the milk they gathered, which they then made into cheese to give to Duke Sforza as pictured on the right. Back in the 1400s the people who lived here would not have owned the land, they would have worked it for the Duke, who owned everything. The word Quintus immediately below the crest means Fifth,and stands for the fifth Duke of the Visconti family, Galleazzo M. Sforza. The words below the crest are Latin. The translation that follow comes from Arthur Urbano, a graduate student at Brown University. This egg (? perhaps this was an archaic or technical term for crest or coat-of-arms) was made by Iacobus (=Giacomo) the son of ("qd" usually means "the late", referring to the father of Jacobus, but I'm not 100 % sure it's "qd") Giovanni, De Fugamo of Giaico. (probably Gisazio as it should be the name of the town Jacobus is from) The thirteenth day of the month of June in the year of the Lord 1449. 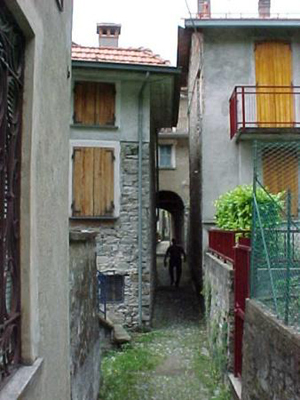 An alley between buildings in Gisazio.